There are some kitchen activities that lend themselves to metaphor. Even if you are not a cook, you will likely know what I mean if I tell you about someone getting roasted at work. Or how I steep in the silence of the early morning before anyone else is up. Or how I have an idea percolating on the back burner. But then there are other activities that only come to mean more through seemingly endless repetition. Whether specific recipes, chores, or rituals, these processes tend to become very personal symbols that are hard to communicate to anyone else. 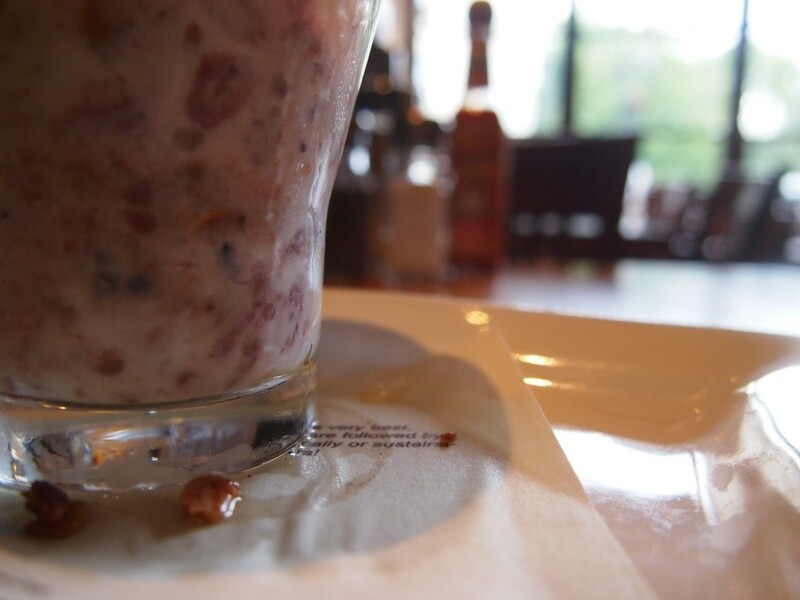 It goes beyond dog eared cookbooks and even beyond consciously recalling a recipe from memory. The process becomes some kind of psychic extension of yourself. You do them not just to have food in the fridge but because the making feeds your soul. 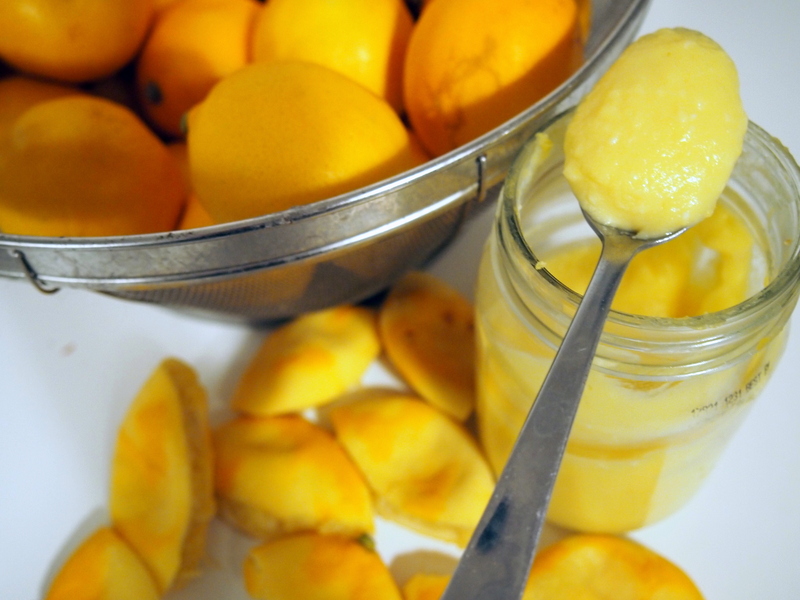 Making lemon curd is like that for me. Every winter I not so patiently wait for the email notice from Local Harvest that meyer lemons and blood oranges are in season. I quickly order several boxes, always afraid that my favorites from Beck Grove will be sold out before I get any. It’s how I imagine the people camping in line for the newest tidbit of technology feel. About a week later, I hear the boxes thud by the door. For the next several weeks my time is spent processing 20 pounds of meyer lemons and another 25 pounds of blood oranges. Dried orange and lemon rings, citrus vinegar, “bloody” marmalade, limoncello… each year I seem to run out of fruit before I’ve finished preserving. I love everything about preserving these fruits. 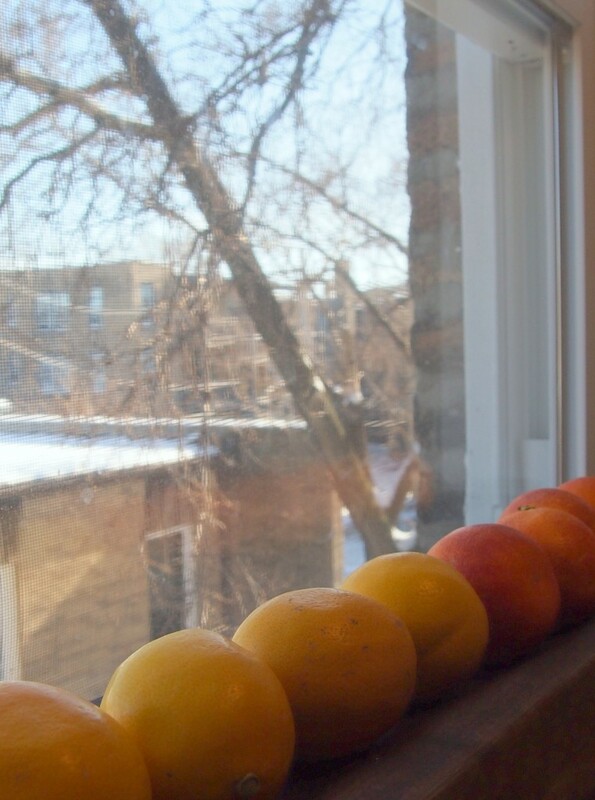 From lining them up on my window sill against the steely winter sky to the blood red stains on my counter.This year I had the privilege of sharing that joy with one of my favorite people. Theodore helped me haul the heavy boxes up the steps and into the kitchen. 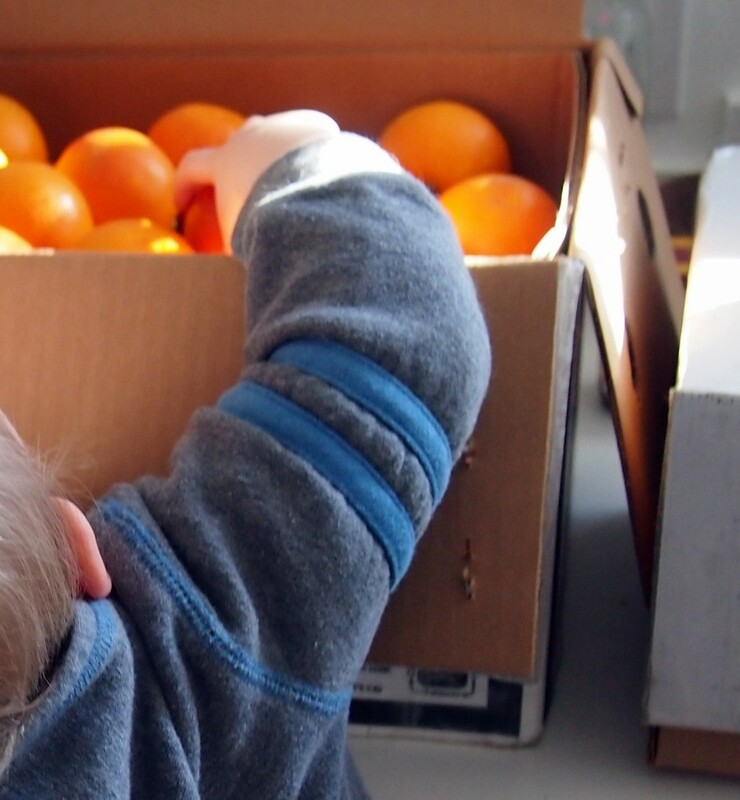 He helped open the boxes and wasn’t the only one that squealed when the glowing yellows were revealed. It was with a small sense of loss that I let him carry one around the house, knowing that it wouldn’t be salvageable for any recipe after he was done with it. 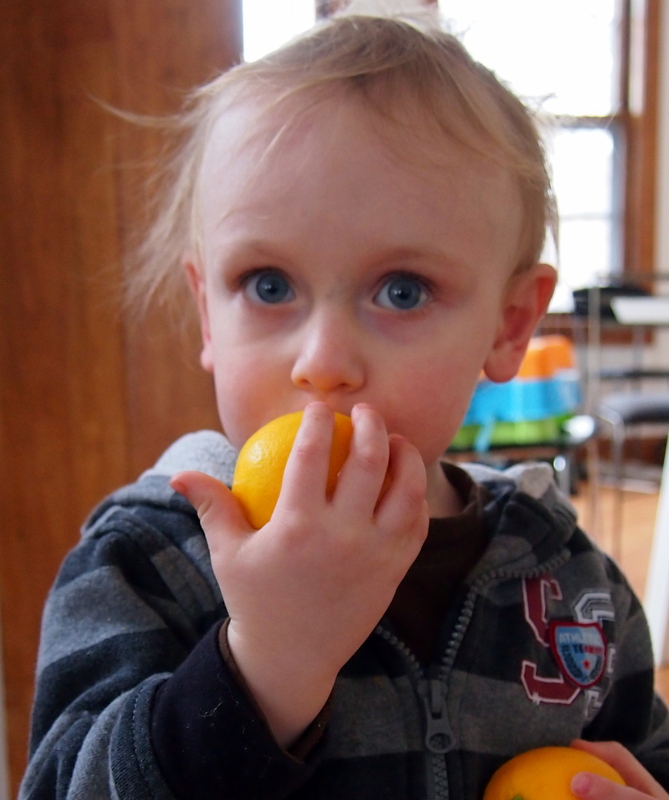 But the loss was recuperated as I got to watch his curiosity lead him to knead, squish, poke, roll, and taste that lemon. Now whenever he sees the lemons sitting on the counter, he insists whoever is at home come smell them, even the cats. I hope to be the kind of parent that will protect and foster that pleasure into his adulthood. Someone who sees such a gift in just the scent of a lemon would truly be a gift to the world. But the part that speaks to my soul is making lemon curd. Somehow, I become the eggs that break. The lemons that are squeezed so hard they bleed. The butter that finds itself melting away with no way to come back. And I feel the whisking. Endless whisking. As I stand over the pot, I feel the flame a little to close to my hand, but I keep whisking. I feel the disturbance in my soul. Beaten to a froth and then beaten some more. Constant constant motion. Never reaching equilibrium. Ceaseless whirling. I begin to wonder when it will end. How long? How long? I don’t know how much more I can take. There’s a thickness that wasn’t there before. The whisk moves more slowly, disturbing less with every stroke. Things become still in the center of the pot. I can see the tracks of where I’ve been. The heat is removed. I can almost hear the curd take in its first breath. And I breathe more deeply too. Is it any wonder that the result of this process is a food that I can’t seem to get enough of? Though it may be possible to point to all the good fats in the butter, the selenium in the pastured eggs, or the vitamin C in the lemon juice, I think there is more going on here than mere nutrition. It is soul food of a different dimension. Zest the lemons and reserve the zest. Juice them into a measuring cup until you have one full cup. 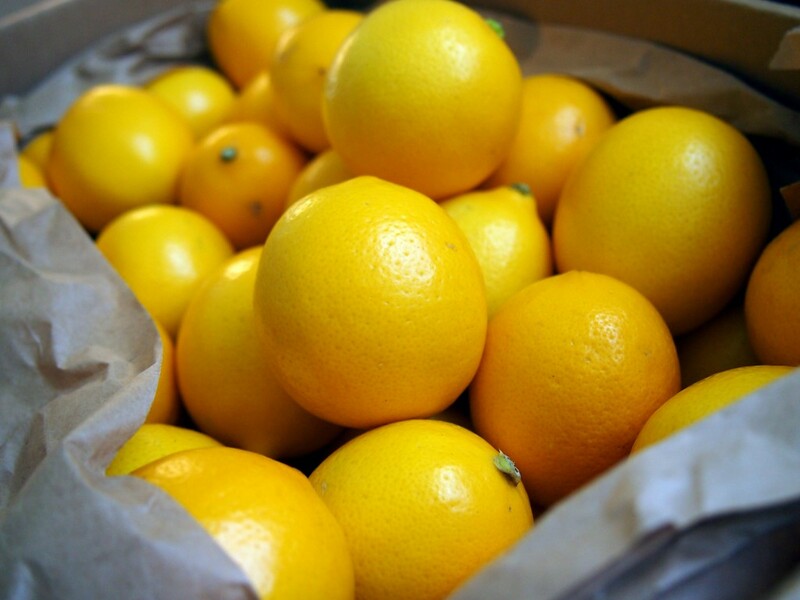 If you are on the cusp of 1 cup, go ahead and juice another lemon. It’s better to have a little too much than too little. Whisk the eggs and honey in a medium pot. Pour the lemon juice through a fine sieve into the mixture and whisk until it’s the color of the first sunny day in spring. Slice the butter into pats and drop into the mixture. Turn the heat to medium high and whisk in the melting butter. Keep whisking almost constantly to avoid the eggs cooking up into chunks. When it suddenly thickens and coats the back of a spoon, turn off the heat and stir in a generous pinch of zest and the cardamom. Pour into jars. Eat one jar straight with a spoon. Tell your family the recipe only made one pint. The curd keeps in the fridge for at least a week and freezes well, though it looses a bit of it’s satiny texture upon thawing. I recently found myself with a baby free morning and nowhere specific to go. 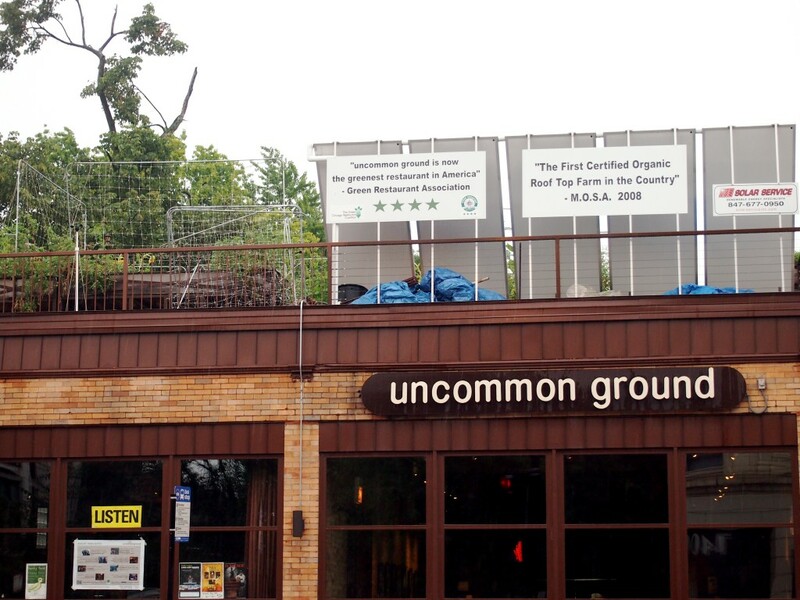 I decided to head to Uncommon Ground, a local spot that wears a rooftop farm as a crown. 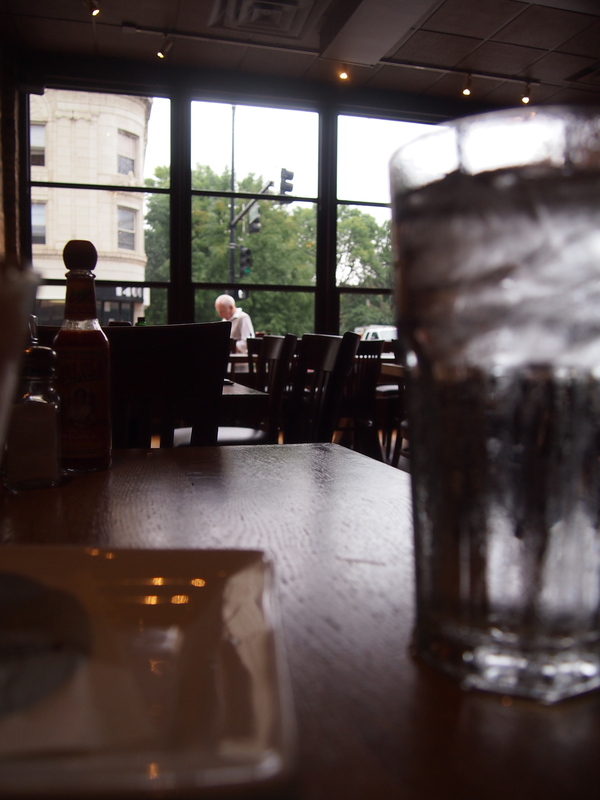 Instead of the coffeeshop atmosphere I was expecting, I was greeted by a hostess who seated me with a menu. I felt the tingle of my old anxiety in my finger tips for just a moment. Dining alone? 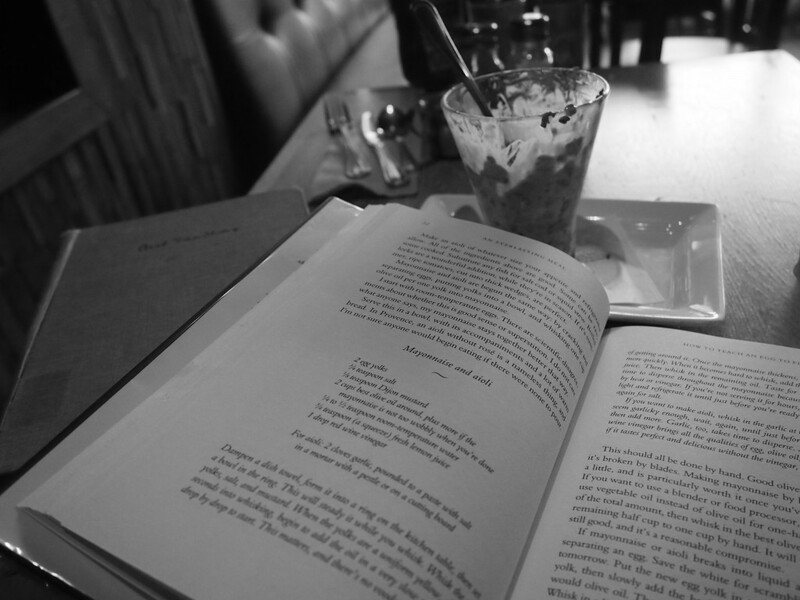 These hours dining alone were a much needed dash of salt. A year ago today I sat just about where I’m sitting now. Propped up on pillows on the right side of the bed a snuggle’s breath away from my sleeping baby. So much has changed. For one thing, the bed now sits in a Chicago apartment building rather than above a garage in South Carolina. For another there are no longer ambiguous stains on my sheets (pee? sweat? breast milk? )- only unambiguous ones (drool, definitely drool). The kitchen cabinets sport baby locks, the desk drawers have yardsticks stuck through the handles, and the trash can sits on top of the sofa. On the book shelf, Ina May’s Guide to Childbirth and Birthing from Within have been replaced by That’s Not My Teddy and Goodnight Moon. Mr. Quotidian and I spend our dates on the couch with a bottle of wine rather than out… somewhere. Our movies come with mandatory intermissions. 6:30 a.m. is considered sleeping in. Yet the babe sleeping next to me is still the same, essentially at least. Yes, he’s longer, heavier, and has 7 teeth now. And yes, instead of just sleeping he also giggles, grabs at cats’ tails, and wills himself towards the ceiling fan. He has gone through several nicknames in the intervening months. (He now prefers Mr. Thed from his daddy and Snuggle-wuggle-wigwam on his silly days.) And yet he still locks eyes with me as he nurses. Still clenches my heart with his cries. Still trusts me. So perhaps it’s me that’s changed? I now know my way around such terms as bilirubin, meconium, and object permanence. I can decipher all most of the forum abbreviations. (Though BM still throws me each time. In mothering forums, it usually means breastmilk. My first thought is always bowel movement.So typical sentences such as “we’ve been giving her a bottle of bm before bed…” always cause a double take.) 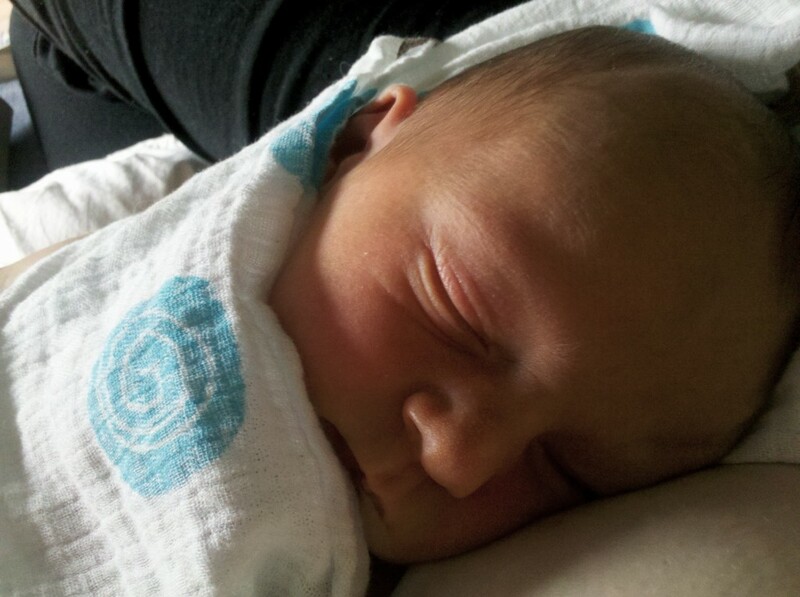 I have working opinions on breastfeeding, infant sleep, milestones, and vaccinations. But those things seem more like growth rather than change. In the same way that Little Man being able to get off the couch by himself is simply a new expression of the established need to explore his surroundings, being a mama has forced me to adapt and learn new coping devices. But does that really change who I am? Is motherhood a feather duster that simply brushes away old habits and selfishness, leaving the shelf cleaner but in basically the same form? Or is it a chrysalis in which everything I am is broken down, liquified, and then remade in an all together new form? How much can a person adapt before they become someone new? Does it even matter? Perhaps it’s just frivolous introspection aggravated by lack of sleep. I feel like I should have some big personal epiphany to share with you regarding motherhood, change, and self. Words that would buff out the scratches and stains left by the day after day after day, leaving the dignity of motherhood to gleam in the melting afternoon light. Lacking that however, I am unsure how to end this. So perhaps I will just settle back into the pillows and watch as the light dribbles shadows across my sweet one’s face. As I have many times this past year. It’s taken awhile for us to come face to face. I was led to believe that we would meet much sooner than this– as if you would be gripping my son’s heel as he was born. But midwives came and went, the birthing pool was filled and then packed away, and my little family nestled in our bed…and you didn’t appear. Even when we had to take him to the hospital. Or when he shivered because I forgot his blanket. Or when I realized I’d been buckling him into his car seat incorrectly. You barely whispered a threat, still as a breeze. How funny that I thought I’d stood against the gale those times. I thought I had won. I should have known it was too easy of a victory. I’d promised myself I wouldn’t let you catch up to me. That I wouldn’t let you trick me out of my birthright of peacefulness. My rational self knows that I will not be able to make the world perfect for him. That he will get hurt on my watch. That he will be disappointed. That his heart will break and dissolve into tears. It’s not that I desire this for him. But I am resigned to it in the same way I’ve come to accept those things for myself. In the same way that autumn is so bitterly beautiful, I know these things are part of being human. 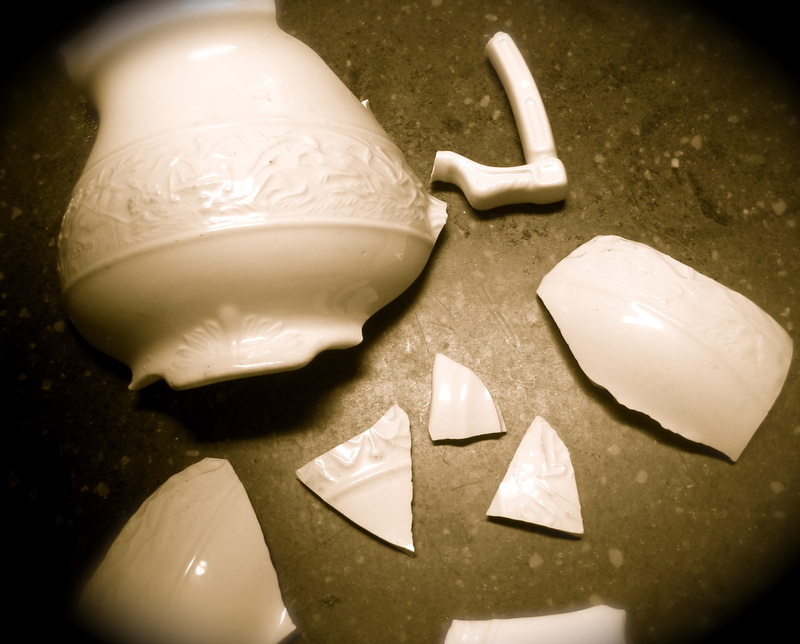 I was determined not to let you disfigure that very fragile beauty. But it seems I was preparing the wrong front. You are a crafty enemy and adept at this through much practice no doubt. You let me win those easy battles, appearing weak. You didn’t attack me with stereotypical things like not enrolling him in baby classes or letting him play on a dirty floor. You didn’t even attack my ability as a mama when I was learning to breastfeed or comfort his newborn cries. Let me think I was a conqueror. Instead you disguised yourself, if not as a friend, at least as something familiar that I am much less capable of defeating. In my blindness you came to me with a familiar touch. I knew the scent of you well in my Bible college days. Like then, the problem is not simply that I am doing something wrong. No. It goes much deeper than actions, things I could fix with enough will power. It’s me. My substance. My soul. There’s not enough of it. Or too much of it. You make deals with me. Do this, and you’ll be a good mama. But just as I manage to do that, you switch out the prize of winsome competence with swarthy inadequacy. I am tired of having to choose between making sure dinner doesn’t burn and being a good mama. 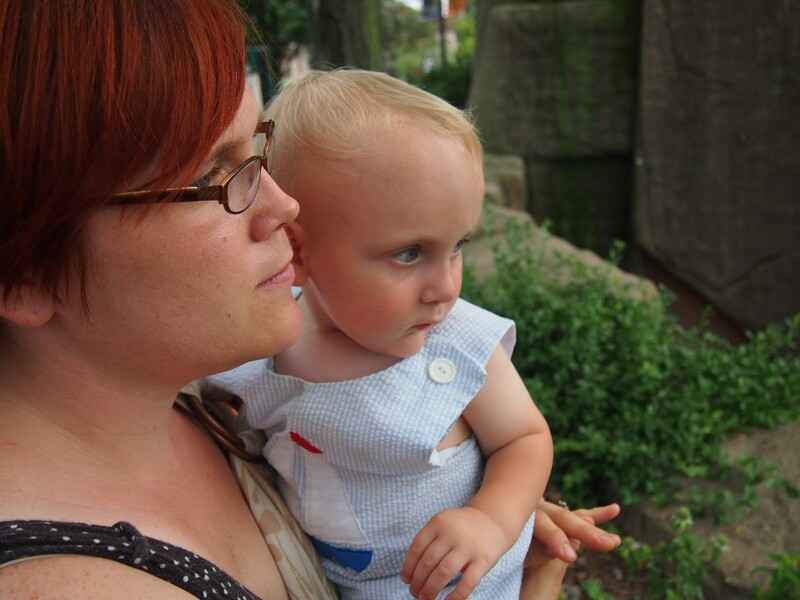 Between shifting to be more comfortable and being a good mama. Between thinking my own thoughts and being a good mama. If I was a good mama, these things wouldn’t be a dichotomy. In a dream world, these needs would gracefully shift up and down the ladder of priorities, glowing with the serenity of angels. But instead they slip and fall and dash their heads on the rocks below. And I always save the wrong ones. Balance is never mine. It seems I will never be free of you. Even into the damp inkiness of night, you grab at me. Force me to wrestle with you till I have no strength left to even hold my babe. I crumple onto the couch. (How is it only 9am?) As I limp through life, I resent what you’ve made of me. I used to be strong. I used to know how to take care of myself and have enough left over to care for others. Why has that ability deserted me now, when I need it the most, to care for the biggest Other I ever will? It’s not always bad. There are moments, hours, even days, of piercing happiness. Where I feel reunited to an estranged part of myself. I am a favored one, blessed with much. I know this. I have a husband who has both flexible work hours and a flexible heart, never once begrudging me the comfort and care I need. My son is healthy and vivacious. Sometimes, when he’s asleep, I sneak into the bedroom just to watch him. He is always breathing and beautiful. We don’t want for anything. My life is coated in many colors of goodness. Why then do I feel so enslaved to you? Why will you not let me go? What can I give you that will appease you? There is precious little in this barren famine-riddled place. My best intentions to try harder, to do better… they wither on the vine. There is no fruit. My emotions are thin and wan. Except for frustration. That at least looms large with ghostly eyes. Isn’t the mark of a mother her endless selflessness? All the poems and songs and books say so. I don’t have it. I try to get by with the minimum effort, as if this were some middle school science project. Perhaps then I am not really a mother at all? I so much wanted to be one of those women who takes gracefully to motherhood. Who, whether or not she planned to have children, allows it to bring out the best in her. Instead all my worst traits are dragged out of me like entrails. I am weepy and selfish. I manipulate and grumble. All my reserves of patience and peace are gone. Even a little fussing makes me grit my teeth. Neediness sends me running to the other room. Having trouble starting a car will ruin my day. When did this become who I am? And yet I know this is a foreign place. I do not belong here. This will not be my final resting place. You cannot fool me. There is a land where sweet goodness flows and I can look up clear. You cannot fool me. I see hope underneath.